Diego Rivera was one of Mexico's most famous painters. He rebelled against the traditional school of painting and developed a style that combined historical, social, and political ideas. His great body of work reflects cultural changes taking place in Mexico and around the world during the turbulent twentieth century. Diego Maria Rivera and his twin brother Carlos were born in Guanajuato, Guanajuato State, Mexico, on December 8, 1886. Less than two years later his twin died. 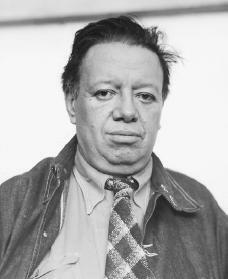 Diego's parents were Diego Rivera and Maria Barrientos de Rivera. His father worked as a teacher, an editor for a newspaper, and a health inspector. His mother was a doctor. Diego began drawing when he was only three years old. His father soon built him a studio with canvas-covered walls and art supplies to keep the young artist from drawing on the walls and furniture in the house. As a child, Rivera was interested in trains and machines and was nicknamed "the engineer." The Rivera family moved to Mexico City, Mexico, in 1892. In 1897 Diego began studying painting at the San Carlos Academy of Fine Arts in Mexico City. His instructors included Andrés Ríos Félix Para (1845–1919), Santiago Rebull (1829–1902), and José María Velasco (1840–1912). Para showed Rivera Mexican art that was different from the European art that he was used to. Rebull taught him that a good drawing was the basis of a good painting. Velasco taught Rivera how to produce three-dimensional effects. He was also influenced by the work of José Guadalupe Posada (1852–1913), who produced scenes of everyday Mexican life engraved on metal. In 1902 Rivera was expelled from the academy for leading a student protest when Porfirio Díaz (1830–1915) was reelected president of Mexico. Under Díaz's leadership, those who disagreed with government policies faced harassment, imprisonment, and even death. Many of Mexico's citizens lived in poverty, and there were no laws to protect the rights of workers. After Rivera was expelled, he traveled throughout Mexico painting and drawing. Although Rivera continued to work on his art in Mexico, he dreamed of studying in Europe. Finally, Teodora A. Dehesa, the governor of Veracruz, Mexico, who was known for funding artists, heard about Rivera's talent and agreed to pay for his studies in Europe. In 1907 Rivera went to Madrid, Spain, and worked in the studio of Eduardo Chicharro. Then in 1909 he moved to Paris, France. In Paris he was influenced by impressionist painters, particularly Pierre-Auguste Renoir (1841–1919). Later he worked in a postimpressionist style inspired by Paul Cézanne (1839–1906), Paul Gauguin (1848–1903), Georges Seurat (1859–1891), Henri Matisse (1869–1954), Raoul Dufy (1877–1953), and Amedeo Modigliani (1884–1920). As Rivera continued his travels in Europe, he experimented more with his techniques and styles of painting. The series of works he produced between 1913 and 1917 are cubist (a type of abstract art usually based on shapes or objects rather than pictures or scenes) in style. Some of the pieces have Mexican themes, such as the Guerrillero (1915). By 1918 he was producing pencil sketches of the highest quality, an example of which is his self-portrait. He continued his studies in Europe, traveling throughout Italy learning techniques of fresco (in which paint is applied to wet plaster) and mural painting before returning to Mexico in 1921. Rivera believed that all people (not just people who could buy art or go to museums) should be able to view the art that he was creating. He began painting large murals on walls in public buildings. Rivera's first mural, the Creation (1922), in the Bolívar Amphitheater at the University of Mexico, was the first important mural of the twentieth century. The mural was painted using the encaustic method (a process where a color mixed with other materials is heated after it is applied). Rivera had a great sense of color and an enormous talent for structuring his works. In his later works he used historical, social, and political themes to show the history and the life of the Mexican people. Between 1923 and 1926 Rivera created frescoes in the Ministry of Education Building in Mexico City. The frescoes in the Auditorium of the National School of Agriculture in Chapingo (1927) are considered his masterpiece. The oneness of the work and the quality of each of the different parts, particularly the feminine nudes, show off the height of his creative power. The general theme of the frescoes is human biological and social development. The murals in the Palace of Cortés in Cuernavaca (1929-1930) depict the fight against the Spanish conquerors. In 1929 Rivera married the artist Frida Kahlo (1907–1954). The couple traveled in the United States, where Rivera produced many works of art, between 1930 and 1933. In San Francisco he painted murals for the Stock Exchange Luncheon Club and the California School of Fine Arts. Two years later he had an exhibition at the Museum of Modern Art in New York City. One of his most important works is the fresco in the Detroit Institute of Arts (1933), which depicts industrial life in the United States. Rivera returned to New York and began painting a mural for Rockefeller Center (1933). He was forced to stop work on the mural because it included a picture of Vladimir Lenin (1870–1924), the founder of the Russian Communist Party and the first leader of the Soviet Union. Many people in the United States disagreed with communism (a political and economic system in which property and goods are owned by the government and are supposed to be given to people based on their need) and Lenin and the mural was later destroyed. Rivera was a member of the Mexican Communist Party and many of his works included representations of his political beliefs. In New York Rivera also did a series of frescoes on movable panels depicting a portrait of America for the Independent Labor Institute before returning to Mexico in 1933. After Rivera and Kahlo returned to Mexico, he painted a mural for the Palace of Fine Arts in Mexico City (1934). This was a copy of the project that he had started in Rockefeller Center. In 1935 Rivera completed frescoes, which he had left unfinished in 1930, on the stairway in the National Palace. The frescoes show the history of Mexico from pre-Columbian times to the present and end with an image representing Karl Marx (1818–1883), the German philosopher and economist whose ideas became known as Marxism. These frescoes show Rivera's political beliefs and his support of Marxism. The four movable panels he worked on for the Hotel Reforma (1936) were removed from the building because they depicted a representation of his views against Mexican political figures. During this period he painted portraits of Lupe Marín and Ruth Rivera and two easel paintings, Dancing Girl in Repose and the Dance of the Earth. In 1940 Rivera returned to San Francisco to paint a mural for a junior college on the general theme of culture in the future. Rivera believed that the culture of the future would be a combination of the artistic genius of South America and the industrial genius of North America. His two murals in the National Institute of Cardiology in Mexico City (1944) show the development of cardiology (the study of the heart) and include portraits of the outstanding physicians in that field. In 1947 he painted a mural for the Hotel del Prado, A Dream in the Alameda. In 1951 an exhibition honoring fifty years of Rivera's art took place in the Palace of Fine Arts. His last works were mosaics for the stadium of the National University and for the Insurgents' Theater, and a fresco in the Social Security Hospital No. 1. Frida Kahlo died on July 13, 1954. Diego Rivera died in Mexico City on November 25, 1957. Hamill, Pete. Diego Rivera. New York: Harry N. Abrams, 1999. Marnham, Patrick. Dreaming with His Eyes Open: A Life of Diego Rivera. New York: Knopf, 1998. Rivera, Diego, and Gladys March. My Art, My Life; an Autobiography. New York: Citadel Press, 1960. Reprint, New York: Dover Publications, 1991. Wolfe, Bertram David. The Fabulous Life of Diego Rivera. New York: Stein and Day, 1963. Reprint, New York: Cooper Square Press, 2000. The more I learn about Diego and Frida the more fascinated I am about their enormous heart and prolific talent. The modern world needs some new heroes of humanity like these two now. A new world purpose must be created that will forge the power to unite humanity once again like never before to overcome the exploitation and almost complete suppression that exists in this post industrial age time. The inevitable struggle of will against might must occur in order for our planet to move forward with progress toward a positive evolutionary outcome. Any other outcome will prolong the current state of backsliding and stagnation that may lead to our complete demise.